Has the cult of Alan Turing finally jumped the shark with the well-made but tepid movie The Imitation Game, starring Benedict Cumberbatch as the British mathematician and computer science pioneer who died of cyanide poisoning in 1954? Over the decades, Turing has become ever more of a folk hero since his death at age 41, displacing one-time proto-computer celebrities such as Norbert Wiener and the awe-inspiring John von Neumann, while crowding out the chance for broad fame of American information theorist Claude Shannon. Turing worship is related to two groups riding high in the 21st century: gays and nerds. The Imitation Game exploits Turing’s status as one of the relatively rare gay-nerd intersections to create a victim for our times. For too long, wad factionalism has divided the wad community, senselessly pitting wad against wad in bitter inter-wad disputes,” dorkwad representative Tad Patrick Reems, 15, told reporters. “Now is the time for us to set aside our differences and join together in opposition of our common enemy”the mean, popular kids who have mercilessly inflicted locker-room wedgies upon us since time immemorial. Movies, however, take a long time to put together. Thus The Imitation Game‘s notion of a gay-nerd alliance against the Haven Monahans now seems more clichÃ©d than galvanising. This is not to say that Turing doesn”t deserve his endless approbation. He was already famous enough from his theoretical papers on computability that the Nobel Prize of computers was named in his honor way back in 1966: the Turing Award. Then the 1974 revelations of Britain’s wartime Ultra project to break the German Enigma codes finally revealed what Turing had been up to in 1939-1945. He had been perhaps the star consultant at the immense Bletchley Park decipherment operation. After 1940, Britain’s chief risk of being forced to surrender was if Germany could starve the overcrowded island by coordinating its U-boats to sink enough freighters carrying food across the Atlantic. Turing’s group never truly succeeded in “breaking” the German Enigma code, but they devised enough ways to exploit enemy sloppiness that the Anglo-Americans had the upper hand after the crisis of the Battle of the Atlantic in 1942-43. It was all much more complicated and exhausting than in the tidy plot of The Imitation Game, but the new movie’s version is close enough. Was Turing the father of the computer, as the movie insists? Once again, the history is immensely complicated, but Turing’s multiple roles as theoretician, technician, and as client (for the secret Colossus electronic computer introduced at Bletchley Park in 1944) are impressive, although not as coherent as a screenwriter would like. 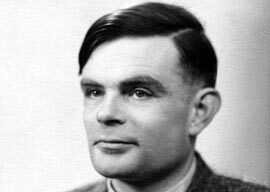 In 1983, a feverish biography by mathematician and gay activist Andrew Hodges established the current image of Turing as a gay martyr. The Imitation Game screenplay”by Graham Moore, the son of Michelle Obama’s former chief of staff Susan Sher”is officially an adaption of Hodges” bio, but is less fervid and more geeky. Moore, previously known for a bestseller detective novel called The Sherlockian, now has his ideal interpreter in Cumberbatch, the thin white duke who became famous playing on the BBC the ur-nerd Sherlock Holmes. It’s hard for 21st-century audiences, who have been instructed that the past was one long featureless nightmare of homophobia, to make sense of the last two years of Turing’s life. The old stereotype of the English elite as prone to homosexuality has been forgotten, but it’s useful in understanding what happened to Turing. After the war Turing did important work on early computers at the University of Manchester. But in 1952, his taste for rough trade brought him embarrassment when some mates of Turing’s teenage boyfriend burgled his flat. Turing called the police, only to be surprised when the Manchester coppers took an unsporting interest in why the distinguished academic was entertaining lowlife youths.